Over the weekend, my 13-year-old son, Christopher, spent the night out at a friend’s where, predictably, they stayed up most of the night playing video games. This leads to the Sunday-afternoon phenomenon known as Zombie Teen. When you let your son or daughter spend the night with a friend when he or she is, say, 8, what you get the next day is Psycho Kid. This monster resembles your darling child only physically; and then, only remotely so — you don’t recall such vast black circles beneath the eyes of said child only a day earlier. And in disposition, oh my no. This new being is grouchy beyond any conceivable normal limits. The snarling anger and immediate dissolve-into-tears the instant Things Don’t Go My Way is completely off the charts. You question why you let them go in the first place. An evening’s peace? So. Not. Worth. It. Then they get a little age on them and, while generally a cantankerous lot, teenagers who are sleep-deprived are dreamcicles compared to the tired versions of their former selves when they return from an overnight with a friend. 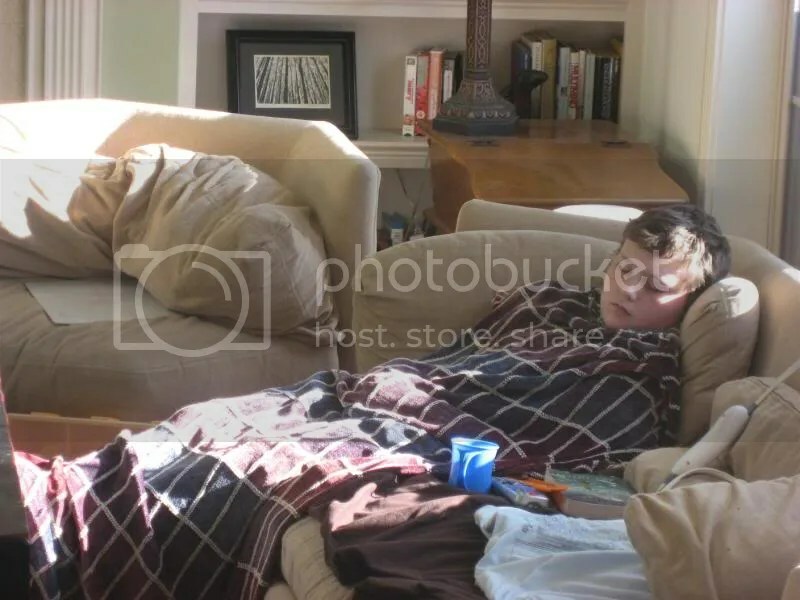 No, the returning teen is a comatose teen, droopy eyed and lethargic — until the inevitable moment when he or she starts to sink into (in this case) the couch and is rendered nearly completely invisible. Please excuse the untidiness. 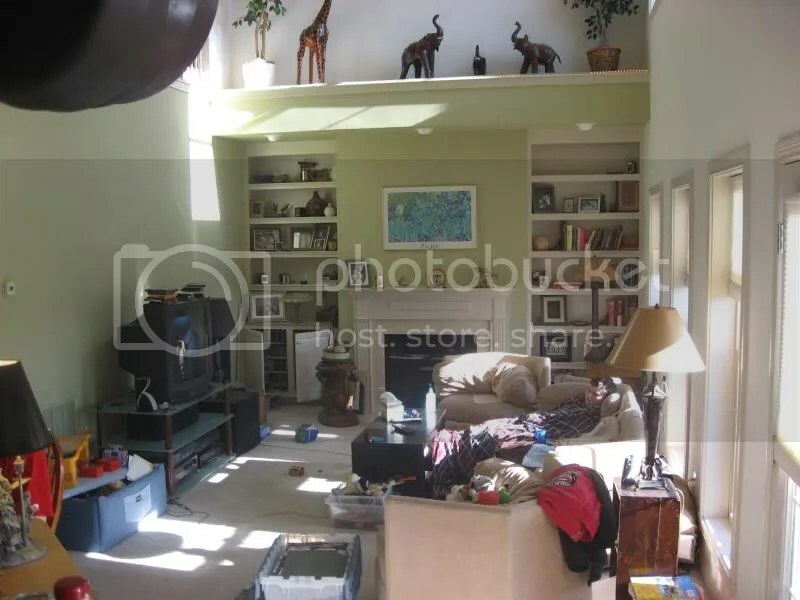 This is my living room, den, all-purpose room, playroom, and partial office. A lot goes on here. A lot of stuff gets dropped here. Think of it as camouflage. Ah, there he is. Melted into the couch. Amazing, isn’t it? Television a-blarin.’ Computer beeping. Music playing. Oblivious. Oblivious he is, the youngster operating on three hours of sleep. He knows nothing but the slump and the slumber, deep in his beige cocoon. There he blended, until suppertime, when the only other thing known to drive children of this age springs into action — the promise of food. Since I’d planned a balanced meal, the pull was not quite as forceful as say, junk food or McDonald’s. But it did propel him back into the land of the living. I just hope I don’t lose him again. Good thing we’ve got the maroon blanket — he might have stayed gone for good. The first picture could be in a “Where’s Waldo” book! I also find it humorous that you say: “junk food or McDonald’s.” I would imagine those would be in the same class for you. Or am I reading that wrong? I guess I was thinking junk food was stuff like potato chips and cokes, whereas McDonald’s is the ubiquitous food for kids, always able to propel them off the couch — or out of the house, if need be! There’s a blog post about your blog that I’m blogging about on my blog. Woot! It’s like a blog-o-rama!